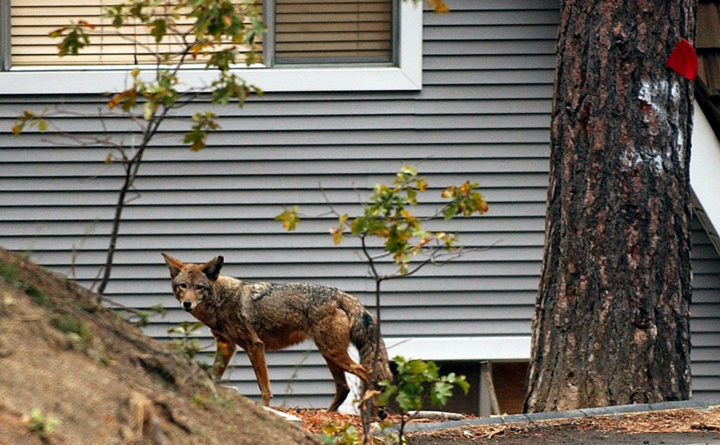 A coyote wanders through a neighborhood in Cedar Glen, California. Many homesteaders worry about protecting their animals from coyotes. The notoriously wily animals may prey on unsuspecting chickens or attack unprotected pets. But though there are certainly incidents of unpleasant experiences with coyotes, much of the fear surrounding the wild dogs is largely overblown. Encountering a coyote can be an unnerving experience, but it is an increasingly common one. Coyotes are found throughout the United States and are increasingly spreading into suburban and urban areas. For some homesteaders, the knee-jerk reaction to seeing a wild predator in a yard is to kill it, but lethal methods of managing coyotes are largely ineffective. Scientific research shows that killing coyotes is ineffective to keeping coyotes away because of the territorial nature of coyotes and their reproductive patterns. A 2016 study comparing lethal and nonlethal methods for wild predator management showed that nonlethal methods were more effective as long-term deterrents. “Their populations will rebound very quickly, and lethal control does not address the underlying factors that often cause or contribute to conflicts,” Fox said. Shooting, trapping or poisoning coyotes can also be dangerous for your pets and the people around you. Such methods are often prohibited by homeowners’ associations and town ordinances. Luckily, there are simple, non-lethal ways to keep curious coyotes from creeping onto your property. How do you keep coyotes away from your yard? The best way to keep coyotes off your proper is by removing their attractants — especially food. “If we don’t remove the attractant that causes the coyote to come to the scene, then we’re not solving anything,” Way said. Remove all food and water sources from your yard. This may include pet food, birdfeeders, fallen fruit and dirty barbecue grills. Install net wire fences around water features like birdbaths, ponds and fountains, or consider removing them entirely. Keep compost and garbage well secured. “All the things that have a smell factor should be well confined and sealed,” Fox said. Fox also recommends clearing away brushy areas around your property than coyotes may see as safe denning or hiding spots. Mow tall grass and remove thin brush and rubbish piles. Flashing lights can help to deter coyotes as well. You can install motion-activated lights on your property to keep them away. Some are even solar powered and require minimal maintenance. If you have natural food sources for coyotes that are always outside — say, chickens or ducks — there are additional measures you can take in securing their coops. Wire mesh fences at least five feet high are the most effective fences to keep coyotes away. A coyote roller — which can be purchased or made cheaply with PVC piping — can also be added to the top of the fence to keep them from being able to jump over. There are kits on the market that will help you set up a protective perimeter around your property using scent tags and sprays made from the urine of larger predators — namely, wolves or mountain lions. “We see anecdotal evidence that they can be effective, but so many of these deterrents are highly contextual when and where they will work,” Fox said. She also recommends to look at sourcing to make sure the product is coming from a wildlife rehabilitation center rather than a fur farm. Will animals keep coyotes away? Certain breeds of livestock guarding dogs can help protect your property and animals from coyotes. Based on Fox’s experience working with ranchers through programs at Project Coyote, she said that Great Pyrenees, Akbash and Anatolian Shepherds have proven to be especially effective in protecting livestock. How do you get rid of coyotes in your yard? “Hazing” is the process of discouraging undesirable behavior in animals using multisensory deterrents, like sound, light and motion. If coyotes have already made their way to your yard, be loud and large by waving your hands, yelling and making loud noises using props like pots, pans, noisemakers, airhorns or cans filled with marbles or pennies. Throw a small projectile to scare the coyote like a tennis ball or a rock. You can also try spraying the coyote with your hose or turning on the sprinklers. After it leaves, the coyote might return. Don’t be discouraged; it can take a few attempts for the hazing to take hold. Consistently hazing when the coyotes return to your property is key. Make sure your methods are exaggerated, assertive and varied.